Sphinx fuciformis Linnaeus, 1758, Syst. Nat. (Edn 10) 1: 493. Type locality: Europe. Synonym. Sphinx fuciformis Linnaeus, 1758. Synonym. Sphinx variegata Allioni, 1766, Mel. Soc. Turin: 193. Synonym. Macroglossa milesiformis Treitschke, 1834, Schmetterlinge Europa 10(1): 125. Synonym. Macroglossa caprifolii Zeller, 1869, Stettin. ent. Ztg 30: 387. Synonym. Macroglossa lonicerae Zeller, 1869, Stettin. ent. Ztg 30: 387. Synonym. Macroglossa robusta Alphéraky, 1882, Horae Soc. ent. ross. 17: 17. Synonym. Hemaris simillima Moore, 1888, Proc. zool. Soc. Lond. 1888: 391. Synonym. Macroglossa bombyliformis heynei Bartel, 1898. Synonym. Hemaris fuciformis musculus Wagner, 1919. Synonym. Hemaris fuciformis rebeli Anger, 1919. Synonym. Hemaris fuciformis minor Lambillion, 1920. Synonym. Hemaris fuciformis obsoleta Lambillion, 1920. Synonym. Haemorrhagia fuciformis circularis Stephan, 1924. Synonym. Hemaris fuciformis jakutana (Derzhavets, 1984). Wingspan: 38--45mm. Forewing discal cell transparent and longitudinally divided by a scale fold; crossveins at apex of discal cell heavily scaled; inner edge of marginal band even or slightly dentate. Spines at the tip of the foretibia rather more prominent than in other species of Hemaris. Distinguished from Hemaris tityus by a much broader marginal band to the wings and the forewing discal cell fold. A very variable species in colour and size, varying geographically, seasonally and individually. Even more variable than Hemaris tityus: in f. musculus Wallengren, all olive green coloration is replaced by reddish grey; in f. heynei Bartel, black as opposed to normal brown is the dominant colour of the central abdominal belt. In the male genitalia, uncus scarcely more than twice as long as proximally broad, the two halves separated only at the extreme apex. Juxta rough with setiferous granules, a little more produced ventrally than dorsally. Valves asymmetrical; left valve spatulate; right valve with concave dorsal margin, and ventral margin deeply sinuate just beyond middle, apical lobe spatulate. Left harpe represented by a basal thickening that bears a few short setae; right harpe represented by a conical process, individually variable and clothed with setae. Aedeagus apical process flattened, obtuse. Diurnal. Unknown in China, but in northern Europe, frequents the Lonicera-entwined edges of sunny glades in open woodland. Farther south, displays a marked preference for sand- and chalk hills lightly overgrown with conifers and shrubby honeysuckles, such as Lonicera xylosteum and L. tatarica, where it is often extremely abundant. Generally avoids open meadows, preferring to fly along woodland margins; however, in Turkey and the Crimea it often breeds in meadows and gardens. 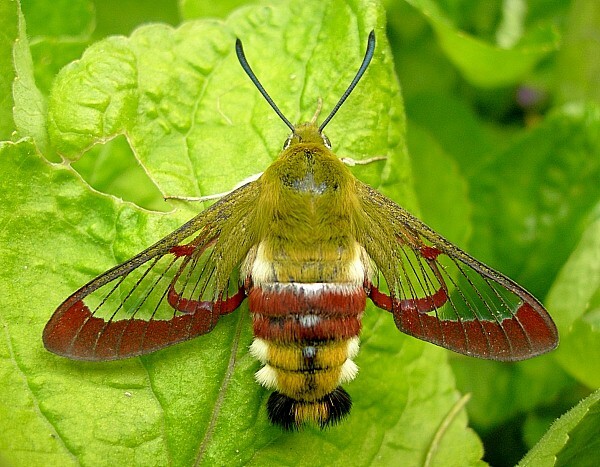 In behaviour, this species closely resembles Hemaris tityus: active by day, usually from about 10.00 hours, it avidly searches along forest edges for flowers. It is in such situations that courtship and pairing take place; the female then takes flight in search of Lonicera growing in partial shade on which to lay her eggs. If disturbed at any time, this species flies off at great speed. China: vi (Xinjiang, ? ?Tchuja Valley); 1-16.vi (Xinjiang, Tian Shan). Mongolia: 13.v (Hovd Prov.). Russia: 27.v (Altai, Barnaul); 3.vi-23.vi (Siberia, Novosibirsk); 10.vi (Buryatia); 11.vi (Altai); 11.vi-16.vii (Khabarovskiy Kray); 25.vi-17.vii (Siberia, Tomsk area); vi (Siberia, Irkutsk); 28.vi (Sakhalin Island); vii (Siberia, Lake Baikal, 800m). OVUM: Pale green, almost sperical (1.0 x 1.1mm), shiny and smooth. Laid singly on the underside of the leaves of its hostplant; plants growing in either deep shade or in the open are generally avoided. LARVA: Full-fed 40--45mm. 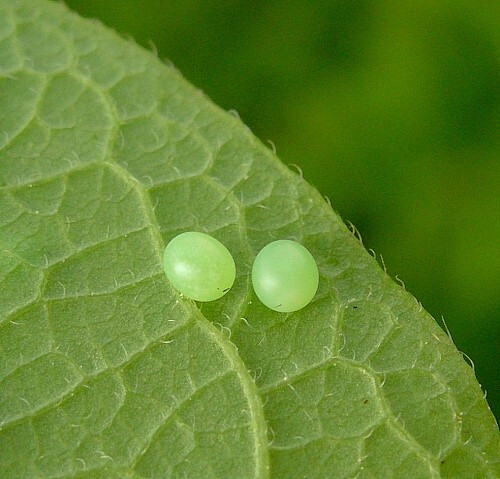 On hatching, the 3mm-long, whitish yellow larva rests along the midrib on the underside of a leaf, occasionally nibbling oval holes in the latter. Most feed at night, resting during daylight hours in a typical sphinx-like attitude. 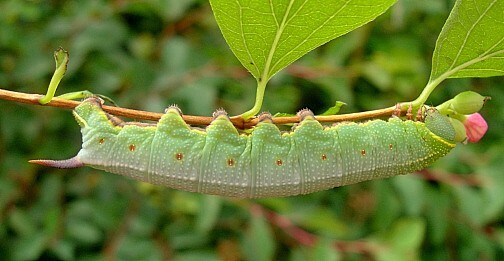 In the final instar body smooth; horn tapering evenly to a sharp point, slightly down-curved. Colour of head bluish-green. Body bright green, paler on the dorsum, with a darker green dorsal stripe. There is also a subdorsal yellow stripe from segment 2 to base of horn, and a narrow yellow subspiracular stripe. Spiracles lying on small-to-large reddish-brown patches; venter reddish-brown. Horn lilac at base, purplish-brown in the middle, dark brown at tip; legs, prolegs and claspers reddish-brown. Some larvae have extensive reddish spots and blotches bordering the dorso-lateral line and spiracles and this, combined with a very rough, tubercled skin, camouflages the larva well. At this stage it generally sits on a twig. If disturbed or alarmed, it will drop to the ground, although not as readily as Hemaris tityus. PUPA: 23--25mm. Similar to that of Hemaris tityus: blackish brown with glossy highlights and brown, intersegmental cuticle. Tapering somewhat sharply frontad. Surface slightly rough and shiny. Cremaster a large, triangular, flattened spike. Formed on the ground in a loosely spun silken cocoon interwoven with debris. The overwintering stage. Larval hostplants. Unknown in China, but in Europe the major hostplants are species of shrubby and climbing Lonicera. Minor hostplants include Deutzia, Galium, Knautia and Symphoricarpos (Pittaway, 1993), while in Turkey, the main hostplant is Cephalaria procera (de Freina, 1979). China: Xinjiang (Tian Shan, 1300m; Yining; Shihezi area). Mongolia: Hovd Prov. (Bulgan River basin, 2000m). Russia: Altai (Yailyu; Barnaul; Chuya River Valley); Siberia (Tomsk area; Novosibirsk; Lake Baikal, 800m; Irkutsk; Bakchar); Yakutia (Lensk; Olekminsk; Yakutsk; Ust Maya; Khandyga); Buryatia (Ulan-Ude); Transbaikalia (Sokhondinskii Nature Reserve (Verkhnii Bukukun)); Amurskaya (Tynda; near Zeya; Ekimchau); Khabarovskiy Kray (Slavyanka; Solnechnyy; Nikolayevsk-na-Amure); Primorskiy Kray; Magadan Oblast (Magadan); Sakhalin Island (Korsakov) (Chistyakov & Belyaev, 1984; Dubatolov, 1991). 'Subsp.' ganssuensis Grum-Grshimailo, 1891 from Xizang Province/Tibet is Hemaris affinis (Bremer, 1861), a distinct species. 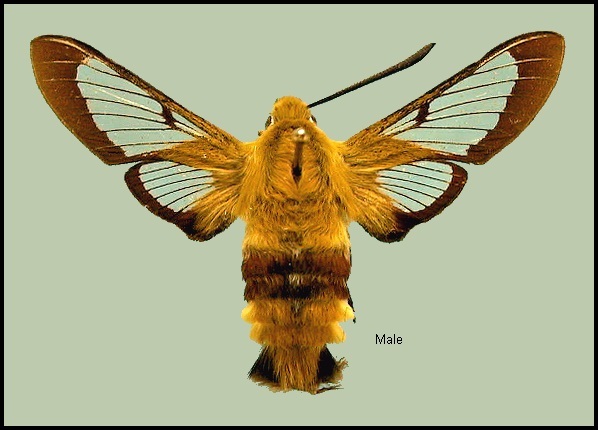 Records from South Korea (Kim et al., 1982; Park at al., 1999) appear to be misidentifications of Hemaris affinis. Widespread across the Palaearctic Region (Pittaway, 1993), from the Iberian Peninsula and southern England, eastward across southern Siberia and southern Yakutia (Kaimuk et al., 2005), northern Amurskaya (Streltzov, Osipov & Malikova, 2003) to Primorskiy Kray (Danner et al., 1998) and Sakhalin Island (Chistyakov & Belyaev, 1984; Dubatolov, 1991). 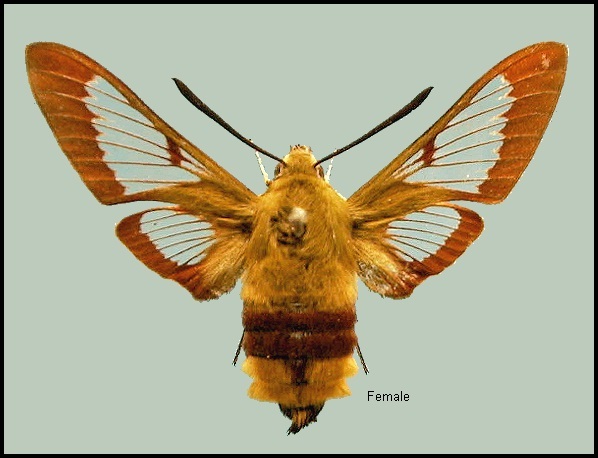 East of the Mediterranean, Hemaris fuciformis fuciformis reaches its southern limit in northern Turkey, northern Afghanistan (Ebert, 1969), northwest India (Himachal Pradesh) (Moore, 1888), the Tian Shan of Tajikistan and China, and the Altai Mountains (Danner et al., 1998). Holarctic; western Palaearctic region. Pleistocene refuge: Polycentric -- Atlantomediterranean, Pontomediterranean and Caspian refugia, with probably a small population in the northern Iranian refuge.